Winter in the garden can be dull. Add plants that will add color and shape to your winter garden. These cool season plants will add a splash of color when you need it most. Sometimes called flowering kale or flowering cabbage these ornamental varieties are grown for their beauty and are not edible. Although they are called flowering they don’t often produce flowers. Instead the beauty comes from the ruffled leaves and lovely colors of pink, white, purple, and yellow. Flowering kale and cabbage are annuals and grow up to 1 to 2 feet tall. They can be started from seed or transplanted. Seeds should be planted late in the summer and will look spectacular in the fall garden. 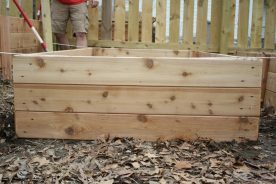 Seeds should be spaced 12-20 inches apart and grow best in full or partial sun. Be sure to keep them well watered. These plants are hardy for zones 2-11 and can survive hard frosts. They can stand below-freezing temperatures and often survive the winter. 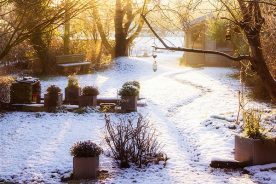 If you live in a zone with harsh winters transplant to pots and keep them on your porch, deck, patio, or entryway for the winter where they might be little more protected. 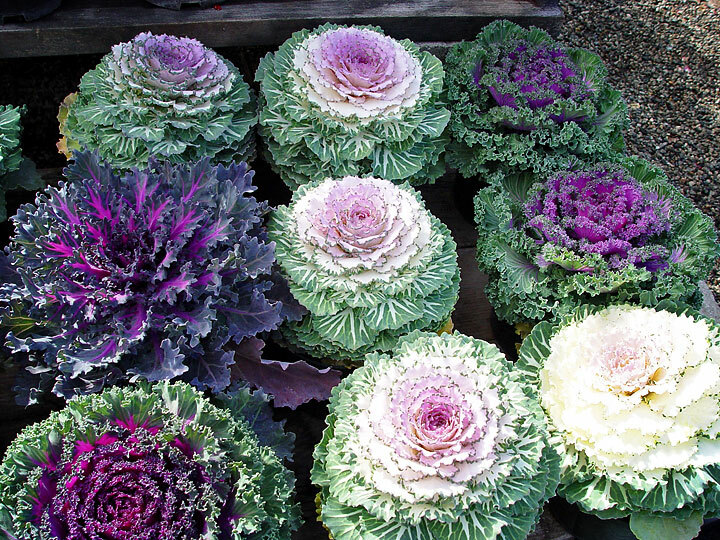 Ornamental kale and cabbages don’t do well in heat so they are best grown in the cool seasons. Camellias are trees and shrubs that provide year-round green foliage and cool-weather flowers. The plants produce colorful blooms of red, pink, and white usually in the middle of January and are a welcome addition to any winter garden. They are on the small-side and get to about 4-5 feet in height and are very long lasting, sometimes living 50-100 years. 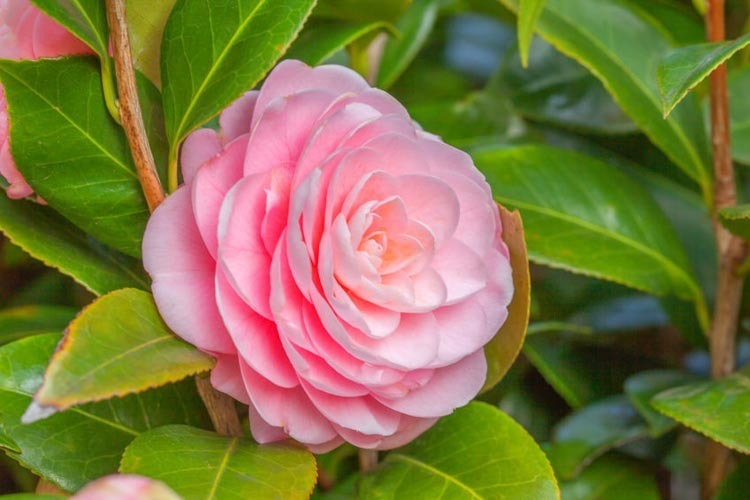 Camellias prefer slightly acidic soil that is well-draining. They do not tolerate wet feet. They grow best in partial shade. Camellias should be planted in the fall or winter for zones 8-10. If you live in zone 6 or 7 plant camellias in the spring so the plant has time to establish a solid root structure before the winter. Camellias are often hardy for zones 7-10, but some varieties can be hardy up to zone 6. 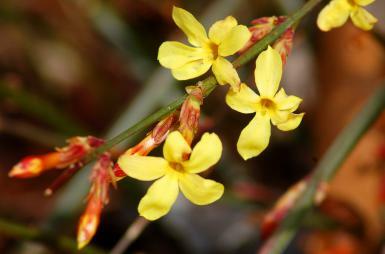 Winter jasmine is a broad or vining shrub that produces bright yellow flowers in January. The shrub grows quickly and once the weeping branches reach the ground they send out more roots. This is a great plant to use on steep slopes or retaining walls with minimal effort from the gardener. The bright green stalks stay green through winter and are a lovely splash of color. It is hardy for zones 6-9 with some varieties hardy up to zone 5. Without a trellis winter jasmine will grow up to about 4 feet tall and 7 feet wide. With a trellis it can grow as tall as 15 feet tall. Plant in the spring spacing the shrubs 5 feet apart. Plants need full sun and regular watering. Holly bush offers a stunning display of evergreen leaves with bright red or gold berries. They really stand out in the winter. The plants range from small 12 inch shrubs to 50 foot trees and depending on the variety are generally hardy for zones 5 through 8. 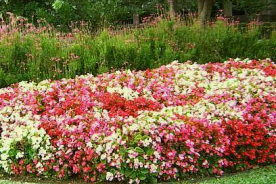 Because there is such a large range in growth be sure to pick the right variety for your landscape. Hollies should be planted in partial sun in well-draining, slightly acidic soil. 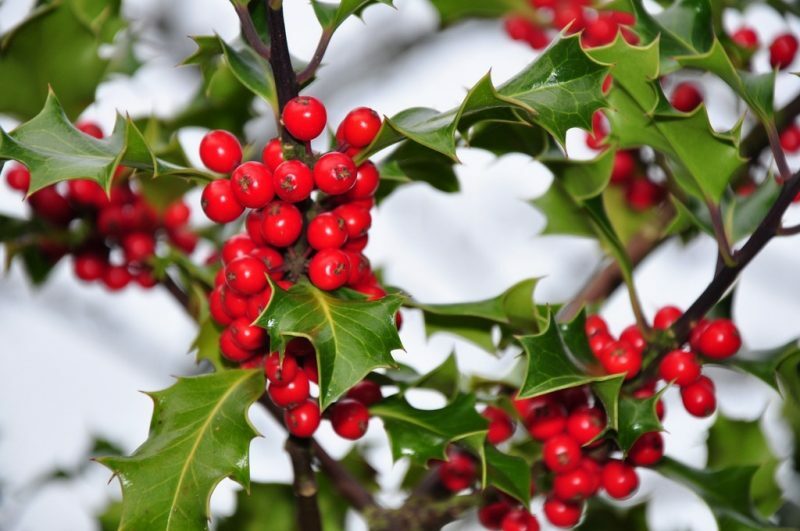 Plant holly in the fall or spring when rain fall is more often causing less stress on the plant. Male and female plants both produce flowers, however only female plants produce berries. Look for varieties that don’t need a male to produce berries or plant a male and female plant close together. 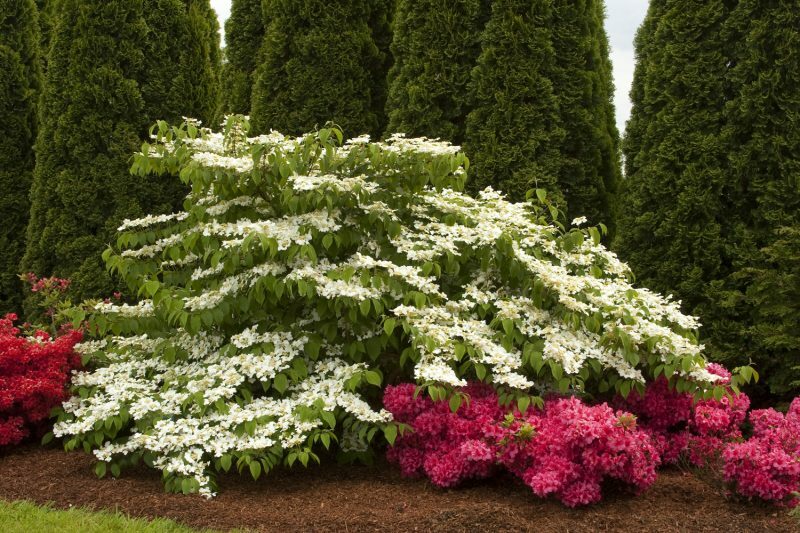 Doublefile viburnum is a rounded shrub that grows with a symmetrical, tiered branch structure. It does not flower in the winter, instead flowering in the late spring followed by bright berries in the fall. The branch structure is lovely and looks beautiful covered in snow. Doublefile viburnum is hardy in zones 5-8. Plant viburnum in the fall or spring in partial to full sun. Shrubs grow 6-8 feet tall and 8-10 feet wide so plan ahead when planting so that it has plenty of room to grow. Pruning the ends of the branches can ruin the elegant structure. Red and Yellow Stemmed Dogwood. 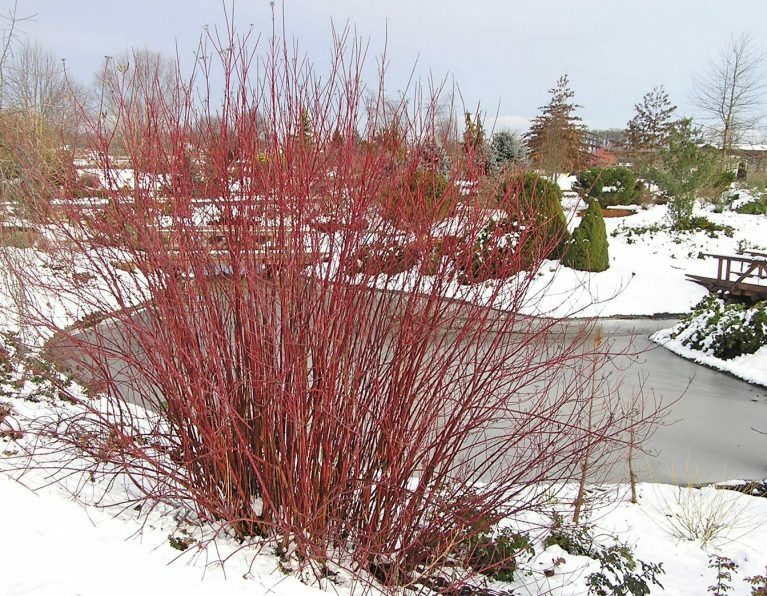 Red and yellow twig dogwood are shrubs that offer wonderful landscaping with their colorful winter stems and show up best against dark evergreens or a snowy landscape. Dogwood is hardy for zones 5-9 and can grow up to 9 feet tall and 5 feet wide. Dogwood blooms in the spring with the flowers turning into berries in the fall. The berries are an important food source for many types of wildlife and are a favorite for robins and cardinals. The attracted wildlife is a bonus for this lovely shrub. Plant in partial to full sun in well-draining soil. Witch hazel is a shrub or small tree that flowers in the late winter to early spring. The yellow or orange fragrant blooms can appear any time from November to March depending on the variety. In the fall the foliage turns gold and is very striking. 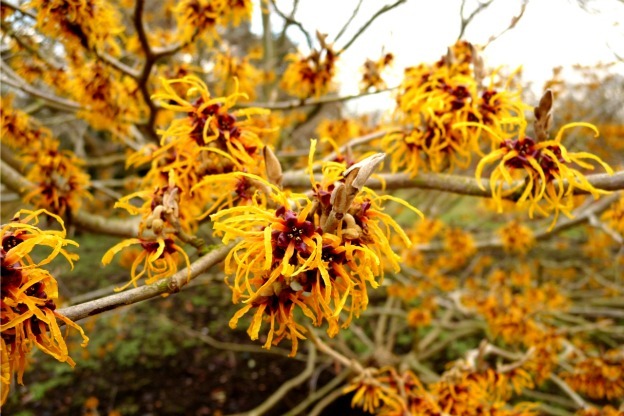 Witch hazel is suited to zones 5 to 8. The shrub can grow up to 15 feet tall and nearly as wide so be sure to give it enough room when you plant it. Witch hazel should be planted in the fall in full sun or partial shade. It will tolerate a variety of soil types and moisture conditions so it will work in most locations. It does not require pruning other than to shape as desired. 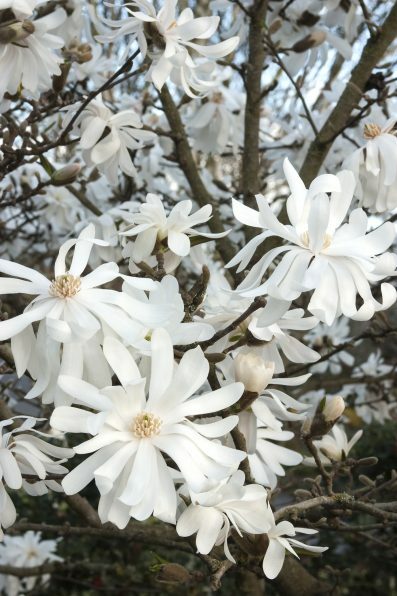 Star magnolia is a large shrub or small tree that produces fragrant, white blooms in the late winter to early spring. Depending on the location this can be between February and April. 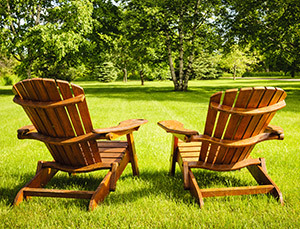 The dark, green, oblong leaves and the smooth, gray bark of the tree make it a stunning addition year-round. The star magnolia is hardy for zones 4-9. It can grows to about 15-20 feet tall and 10-15 feet wide. It prefers full to partial sun and will tolerate most soil types and moisture conditions and even tolerates moderate flooding as well as moderate droughts. It can be trained to grow as a shrub or small tree. Snowdrops are a bulb that reliably blooms at the end of winter. It is one of the first blooms of the new growing season. Snowdrops are often grown in regions with cold and moderate winters. They do not do well in regions with warm winters. 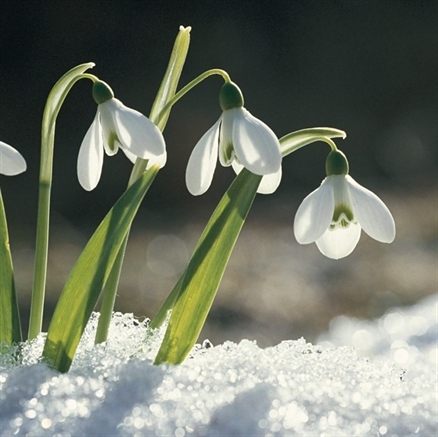 Snowdrops are hardy for zones 2-9, but do best in zones 4-7. Plant snowdrop bulbs in the fall to ensure they’ll have the chilling period they need before they bloom. Plant the bulbs in a moist, well-drained area that is sunny when they bloom, but partially shaded once they go dormant (in the late spring). 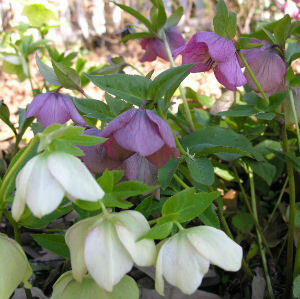 Lenten roses are a type of hellebore with leathery evergreen leaves and rose-like flowers of pink, red, or white. New growth of the plant usually occurs in January or February with flowers that often bloom with snow still on the ground. The plant grows 15 to 18 inches tall as a ground cover and is hardy for zones 4-9. Lenten roses should be planted in the spring and spaced 15 inches apart. It may take up to three years for the young plant to produce blooms, but it is worth the wait. Plant in a shade bed with other shade-loving perennials such as hosta. Christmas rose is another type of hellebore that blooms of pink, red, white and even light green from late December to early spring on stout stems that rise above modest snowfalls. It is a very easy plant to grow and seeing the blooms when everything else is frozen is very rewarding. In areas of the country where blooms in the winter are rare these hellebores are a wonderful treat for the eyes. 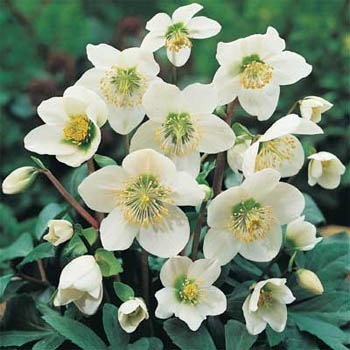 Christmas rose is an evergreen perennial that grows to 12 to 15 inches tall. Plant the long-living perennial in the spring in a shady spot spaced about 15 inches apart. The soil should be moist, well-draining, and rich. It is hardy for zones 4 to 8. Boxwood plants are dense, evergreen shrubs that provide lovely foliage. They are often grown for their pleasing shapes and form and add texture to gardens. Boxwood can be grown as formal hedges and are easy to shape as such. Consider using them as borders for paths or garden outlines. Boxwood should be planted in an area that will receive full or partial sun. 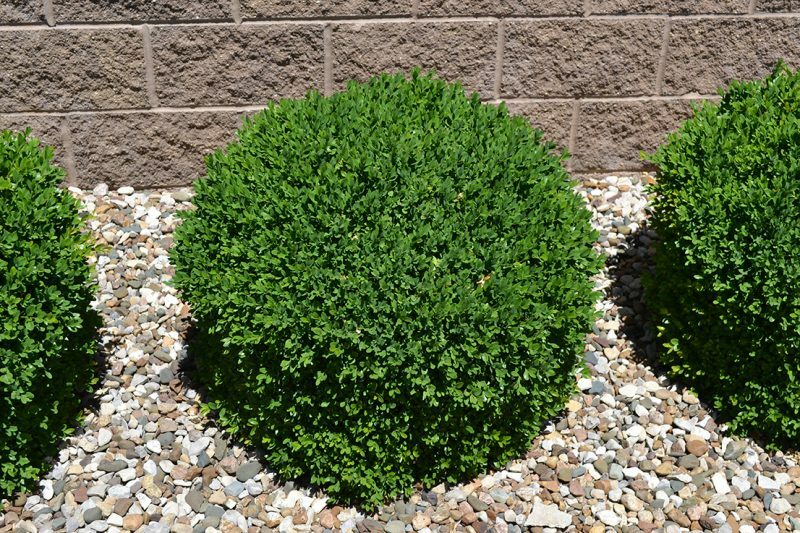 If you live in an area with very hot summers, boxwood shrubs may need more protection from the sun. Be sure to water frequently. Boxwood should be planted in the fall in slightly acidic to neutral soil. Other than pruning as desired to achieve a certain shape, the boxwood plant is rather low maintenance.